The world of cosmetic surgery has advanced tremendously over the last two decades. New procedures have emerged that can make an individual look and feel younger in a very short time. Amongst the vast number of cosmetic procedures currently available, the face lift is a commonly performed procedure that is sought after by both men and women. 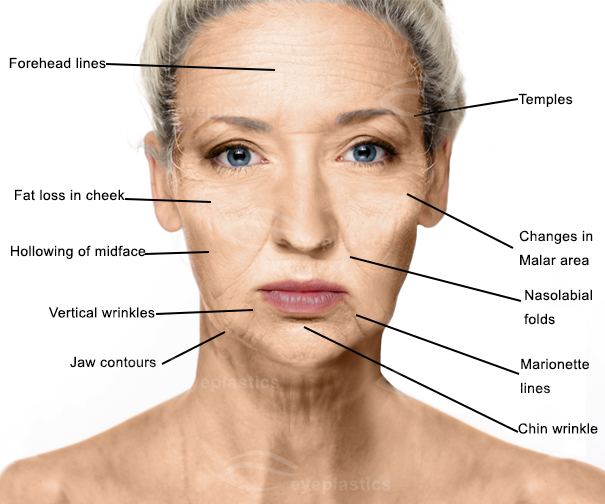 Here we shall take a look at the Facelift procedure in a little more detail. A face lift is called a rhytidectomy in the world of medicine. It involves tightening the muscles of the face and smoothing the skin so that the face appears younger and rejuvenated. However, it must be remembered that a face-lift is not a total anti-aging solution. General health and fitness, body and skin, are critical factors. Traditional Full Facelift: The traditional full facelift provides a comprehensive plan to improve numerous of the signs of aging. It can effectively improve sagging around the cheeks, lines around the mouth, extra fat and rolls under the chin, and jowls. This lift requires extensive incisions along the temple, around the ear, into the hairline behind the ear, and skin flap elevation down into the neck. It is typically chosen by those between 50 to 70 years of age. Mid-Facelift: A mid-facelift involves lifting and tightening of tissues below the eyes and around the cheeks. This requires deep surgery to improve the contours of the face and to sculpt prominent cheekbones. As this procedure is limited to the mid-face, candidates are usually men and women between 30 and 60 years who just want subtle changes. Post-operatively the goal is to look refreshed rather than “overhauled”. Mini Facelift: A mini facelift can do just that with smaller incisions and a shorter recovery period. Mini facelifts are ultra-focused and target small, precise areas such as jawline and lower cheeks. Incisions are made in front of and behind the ears and excess skin is excised. This procedure can be done under monitored anesthesia care and does not usually require post-operative drains. 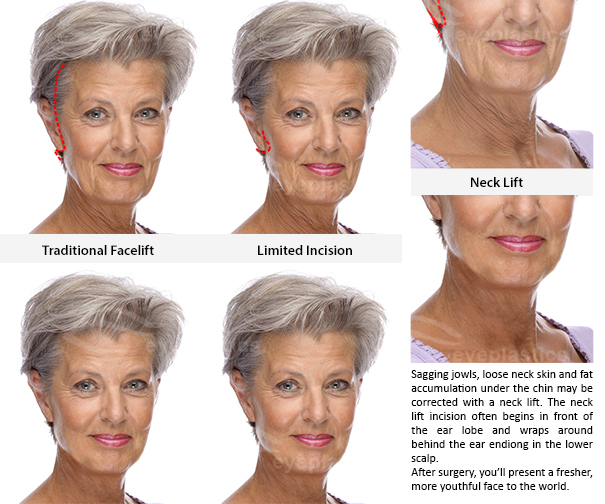 Lower Facelift: A lower facelift focuses on the lower third of the face and is a terrific procedure for improving jowls, defining the jawline, reducing deep nasolabial folds and helping sagging lines starting at the corners of the mouth. A Lower facelift is used for patients of most age groups to reduce the signs of aging and to promote facial rejuvenation. Submental Facelift: This is sometimes referred to as “necklift” and involves removal of fat directly or with liposuction, with or without muscle plication. It would be used to improve a double chin. Incisions are made in front of and behind the ear, as well as under the chin. A drain is usually placed for 24 hours after surgery. This procedure is usually appropriate for middle-aged men and women, but may possibly be indicated for younger patients. When is a face-lift offered to patient? A Face-lift is offered in a number of different scenarios. The presence of deep creases in the middle of the face or at the mouth and jawline are some indications. As we get older, the collagen in our face is gradually lost and this makes the skin on the face appear rather unsightly. In adds to, the loss of skin tone can create loose and saggy skin on the face. In such situations, a face lift is wonderful, as it can significantly improve the appearance of saggy skin and wrinkles. First, the patient will have a detailed consultation with their surgeon regarding the benefits and risks of a face lift. For the decided upon procedure, the patient is placed under sedation or general anesthesia. Incisions are made and the skin and underlying tissue is moved around and redistributed across the face in order to give the face a fuller and less droopy appearance. Additional incisions may possibly be made under the chin if needed. At the conclusion of the face-lift procedure, the incisions are closed cosmetically with a combination of sutures, staples and possibly tissue glue. The goal is to have a scar that is barely visible. A face-lift can rejuvenate one’s external appearance and by doing so can improve overall confidence of the recipient. Are there any risks of face lift? There are risks associated with a face-lift, which is the case for any surgical procedure. There are certain risks associated with the anesthesia itself. In some individuals, the incisions may possibly not heal optimally and additional treatment may possibly be required. Damage to underlying tissues and structures, such as the facial nerve, can occur but is rare. The risk of disappointment and/ or dissatisfaction after the procedure can hopefully be reduced by having in-depth pre-operative discussions with the surgeon concerning reasonable expectations for the procedure planned. An infection can occur any time an incision is made and would necessitate treatment with antibiotics.